Gradual bed support in a compact design! Our new Folding Incline Wedge Cushion provides a gradual incline for your bed, designed to comfortably support the head and chest in an upright, slightly angled position. Very easily allows single users to raise their upper body during sleep, a position recommended for reducing symptoms from acid reflux, GERD, heartburn and other digestive conditions. 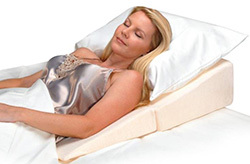 Also provides a gentle support to help you sleep comfortably. The folding design allows for compact storage.